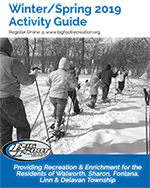 Big Foot Recreation is committed to providing quality, inexpensive programs accessible to everyone in the Big Foot Recreation District. We do not want a financial hardship to be an obstacle for participating in our programs. A Scholarship Fund has been set up which will provide partial subsidies to eligible residents for selected recreation programs, as funds are available. Any resident of the Big Foot Recreation District is eligible to submit an application for a scholarship. Applicants must submit a “Request for Scholarship” form to the Big Foot Recreation District. Applications must be submitted three weeks prior to the start of the program. Scholarships are awarded in increments of 25% or 50% although may be less if funds are scarce. Requests can be made for individual programs. Annual blanket approvals can also be made. Personal hardship will be determined on an individual basis. Any Big Foot Recreation District resident may request a scholarship for a recreation program when a need exists. Those requests must be made in writing on an official “Request for Scholarship” form. All requests will be evaluated based on financial and/or personal hardship. The District will employ the State and Federal standards for determining eligibility. Scholarships are awarded in increments of 25% or 50%. Participants in the scholarship program must be residents of Big Foot Recreation District. A letter from school stating that the family qualifies for the Free & Reduced Lunch Program. The letter must be issued within the current school year (August through June) and should contain the child's home address. A photocopy of the letter will be considered sufficient proof. If a letter from the school is not available, a copy of the applicant family's most recent U.S. Internal Revenue Service Tax Return form shall qualify as proof. State and Federal guidelines for financial assistance or low income will be used to determine eligibility for scholarships. The scholarship may be used for registration fees only. The scholarship cannot be used for Special Events & Trips, classroom materials, special programs and late fees. Applications for Scholarship will be determined on a case-by-case basis. The number and amount of scholarship funding is available based on the Scholarship Fund. or call (262) 275-2117 for more information.